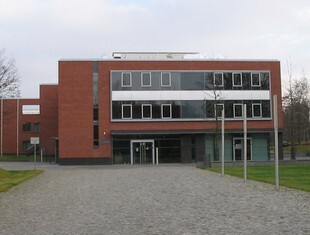 The Hasso Plattner Institute (Hasso-Plattner-Institut für Softwaresystemtechnik GmbH) , shortly HPI , is a German information technology university college, affiliated to the University of Potsdam and is located in Potsdam-Babelsberg nearby Berlin. Teaching and Research of HPI is focused on "IT-Systems Engineering". HPI was founded in 1998 and is the first, and still the only entirely privately funded university college in Germany. It is financed entirely through private funds donated by its founder, Prof. Dr. h.c. Hasso Plattner, who co-founded the largest European software company SAP AG, and is currently the chairman of SAP's supervisory board. President and CEO of HPI is Prof. Dr. Christoph Meinel.